Premier Summit for Leading Airport City Developers, Airport Operators, Urban Planning Authorities and Real Estate Groups to at the Development of Aerotropolis! Modern airports are finding themselves more profoundly integrated in cities’ urban planning & development. As non-aeronautical and aviation-related businesses increasingly locate themselves at major airport hubs, commercial airports are widely recognized as significant drivers of business centres and catalysts for urban economic growth. Evolving alongside with regional operators of ports, airports as well as public authorities for land & maritime, the Dredging & Land Reclamation Asia Summit series have become unmissable annual forums for project leaders, decision makers as well as technology providers. Participants attending this annual summit are offered exclusive opportunities to hear and share latest projects, high-profile case studies, best practices and proven technologies to help them overcome project challenges. In 2018, the 9th Annual Dredging & Land Reclamation summit will return to Singapore with greater amount of case studies, with particular focus on projects developed by ports, coasts, urban lands and airports around the world. Masterclass FOCUSED on Case Studies, Real Life Scenarios, Lessons Learned on Sustainable Asphalt Pavement Design, Materials and Management! 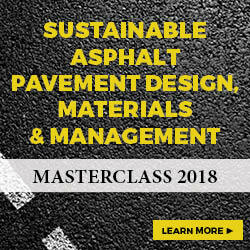 This practical, case-study driven, and in-depth 5-day course is to familiarize and enhance the practical knowledge of engineers and superintendents with the principles of asphalt pavement design, materials, construction, maintenance, and rehabilitation.The course will also cover the latest U.S. and European pavement technology including the concepts of sustainable pavement, Mechanistic-Empirical Pavement Design, Superpave applications, Warm-Mix Asphalt, and asphalt rubber. The course includes lectures, video clips, practical exercises and use of computer programs. EQUIP GLOBAL’S Procurement & Contract Management of Infrastructure Projects Summit 2018 Return to Singapore in July! Budget overruns, schedule delays, poor quality, lower customer satisfaction, contract and procurement fraud, procurement risk, supplier-related issues and change in contract management. These are the biggest challenges still commonly faced by procurement & contract managers in the infrastructure industry.